Below, you see a map of Jutland, Denmark with neighboring towns, attractions and sights marked. Below the map, the various places are elaborated with descriptions, distance to Brusaa Udlejning etc. Besides the following cities, there are groceries shopping opportunities at Gundersted Grocer, 1 km from the house. Aars: Just 14 km from the house, lies the city of Aars. The city has several shops, restaurants and attractions. For more information about being a tourist in Aars or Løgstør, follow the link here. Løgstør: 22 km. from the house is Løgstør. Løgstør is known as the “clam city” and the city has, besides restaurants and boutiques, galleries and the Limfjords museum. Nibe: The “herring town” of Nibe located 18 km from the house is characterized by its narrow streets and low municipal houses. Read more about being a tourist in Nibe here. Aalborg: Aalborg is Denmark’s fourth largest city and lies just 36 km from the house. The city has everything from mini to giant shopping malls. Tourists page is located here. Apart from great center and great shopping opportunities, there is also Aalborg Zoo. There are numerous golf courses in a short distance from the house. These include: Himmerland Golf, Løgstør Golf, Hvalpsund Golf, Aars Golf, Fjerritslev Golf, Sebber Golf and Rold Skov Golf. These are indicated by a small golf icon on the map above. In a very short distance to the house, there are several bowling lanes. 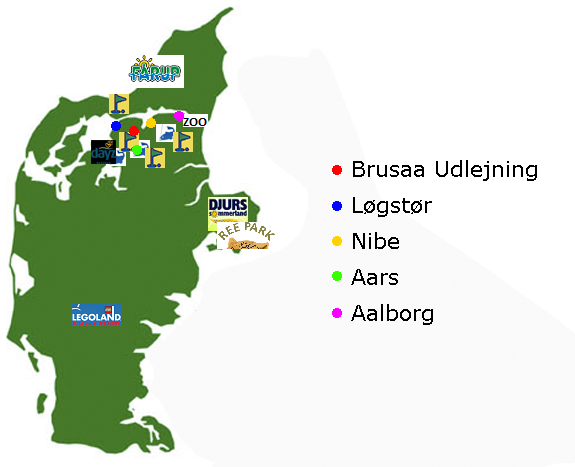 These include bowling centers (with dinner) in Gatten, Rønbjerg, Fjerritslev, Aars and Aalborg. There are put and take-fishing lakes in Lundby, Gunderup, Farsø, Hvalpsund and Søttrup (marked on the map). In addition, many lobelia lakes nearby. These are characterized by a rich animal and bird life. In for example Navnsø, it is also possible to swim in the clearest and warm water. Among the lakes nearby include: Navnsø, Halkær sø, Øjesø, Vilsted sø and Sjørup sø. If you are interested in having a swim dip, it is also possible to swim at the many nearby beaches. This may be in Løgstør, Hvalpsund, Trend ot at Vesterhavet, for example Svinkløv or Slettestrand. Thorup shore may be mentioned as the fishing boats are still drawn directly on shore – a unique, Danish occupation.